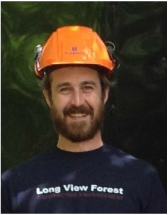 Long View's woodland service crew members work closely with both forest management and contracting staff in the care and tending of the forest. The varied activities they focus on create critical links in the chain of treatments necessary to achieve excellent results through the long lives of trees. A variety of invasive plants are now established in and around our region's forests. Some species grow rapidly and can interfere with the ability of native trees to become established and survive. Long View's woodland service staff use a variety of tools and techniques to reduce and manage these infestations. We tailor methods for maximum effectiveness to the species present, degree of infestation, and weather and site conditions when work occurs. 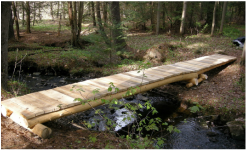 Timber stand improvement (TSI) is any activity aimed at improving the future growth of the forest when the trees to "weed" are too small, poor quality, or inaccessible for commercial harvest. Long View's woodland service staff use small chainsaws and clearing saws to create extra growing space for the best trees. Identifying and encouraging the best specimens early is the easiest and most effective way to grow a forest full of great trees. Having easy access to the woods is one of the surest ways to foster excellent management and allow regular enjoyment and use of forest resources. 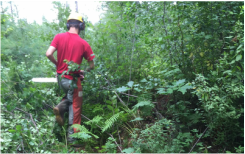 Woodland service crew members use small equipment and hand tools to build and maintain winding trails for landowners who enjoy narrow footpaths through their forest. When heavy equipment is needed for larger multi-use road and trail projects, Long View's contracting staff are available to help. Rounding out the woodland service crew's activities, are occasional projects pruning trees (for fruit production, timber value, or tree health), planting trees, and doing small scale removals and chipping along trails, field edges, and near buildings or other structures. Tom is the daily on the ground lead for the woodland service crew. 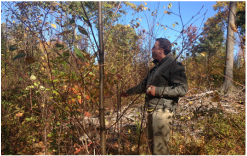 His background and greatest expertise is in invasive plant control after multiple seasons of work experience in southern New England (where the problem is unfortunately much worse). Tom earned a B.S. in Wildlife Biology from Framingham State University in 2014 and is a certified commercial pesticide applicator in Vermont and Massachusetts. He joined Long View in 2015 and lives with his wife in Wardsboro, VT. Banner photo at top: Thom Chase and Tom Groves with their clearing saws ready for a day of Timber Stand Improvement work.